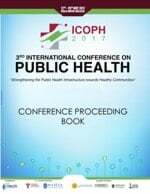 Vol 3 No 2 (2017): Proceedings of the 3rd International Conference on Public health is dedicated to disseminating research papers presented in the 3rd International Conference on Public Health 2017 from 27th – 29th of July 2017, Kuala Lumpur, Malaysia. The papers reveal study findings in the areas of Health Care Systems, Maternal Health, Primary Health care, Oral Health and Pharmacy, Sociology and Health. ASSESSMENT OF IMPLEMENTATION OF THE PHILIPPINES’ EXPANDED BREASTFEEDING PROMOTION ACT OF 2009 (REPUBLIC ACT NO.